The perfect choice for your next Cocktail Hour, Welcome Reception, or Banquet. Up-Close Magic that is done right under your nose. Sleight-of-Hand at its finest! SECONDS . . . that is all the time you have to stop attendees on a Trade Show floor. 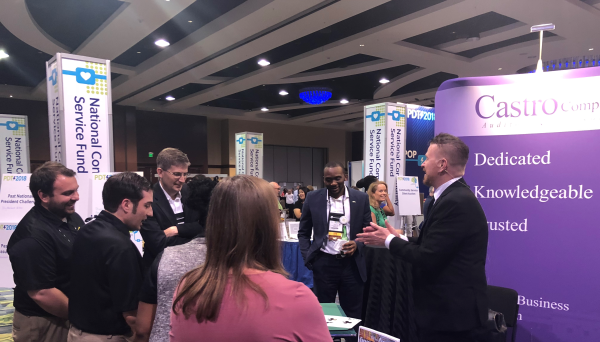 Have Trade Show Magician Kevin King stop Traffic, attract Crowds, deliver your Message, get Leads, and close more Sales. If you want to guarantee more attention and excitement at your next Trade Show. If you want potential customers to hear YOUR message. If you want to attract more quality leads and increase your ROI. Kevin usually delivers 3 times MORE attendee traffic to your Trade Show booth than surrounding booths! Includes Amazing Magic, Clean Comedy, and Joyful Audience Participation! ​From a Fast-paced 10 minute Cabaret Act to a 90 minute Full Stage Show let Kevin bring the Magic to your next event. WHAT DOES A CLOSE-UP MAGICIAN DO? A Close-up Magician is a magician that performs magic up close, literally inches away from your face. They will mix and mingle among your guests performing incredible sleight-of-hand. It's fun, it's interactive, and it is sure to have your guests thoroughly amazed. 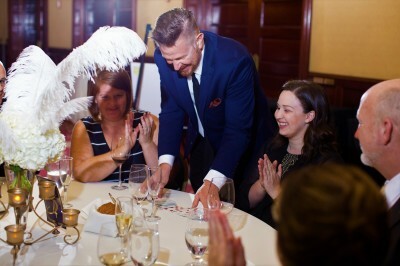 WHY WILL A CLOSE-UP MAGICIAN WORK FOR MY EVENT? 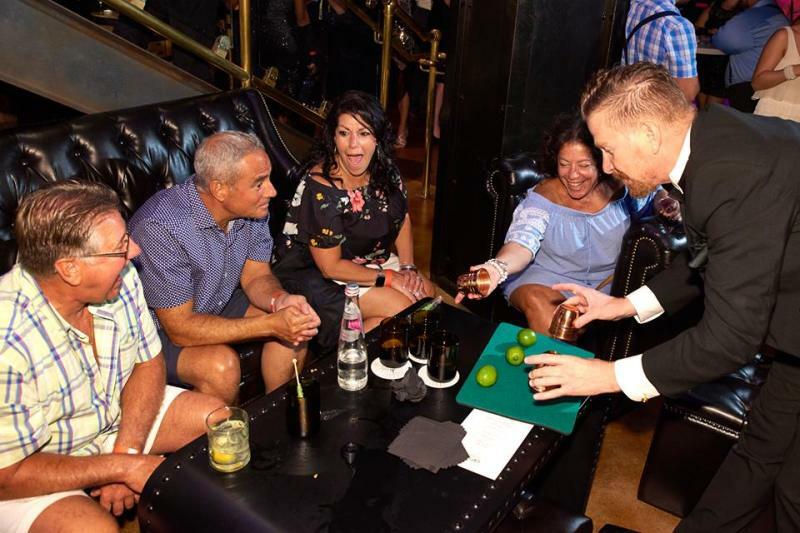 Because Strolling, Close-up Magic is so versatile it lends itself to many events: Cocktail Receptions, Dinners, Award Nights, Networking Events, and the list goes on. Anywhere there are a group of people together in a social environment Strolling, Close-up Magic will have a great impact. The time is flexible and can be customised to your event. WHEN IS THE BEST TIMES TO USE A CLOSE-UP MAGICIAN AT MY EVENT? A good time to use a Strolling, Close-up Magician is when people are arriving. When people arrive to the events, they are sometimes a little bit nervous and maybe there are groups of people who don't know each other. 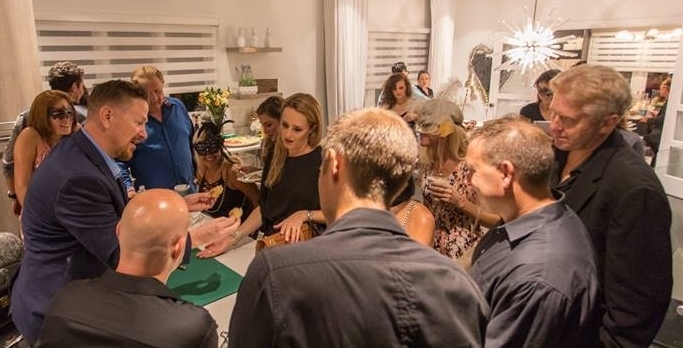 Having a magician meet and greet your guests is a fantastic ice breaker, it gets people relaxed, chatting, and having fun right from the start. 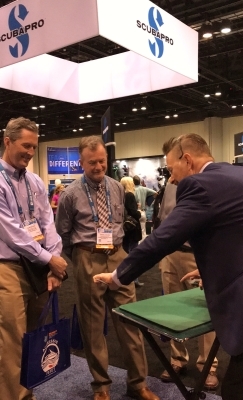 During the cocktail hour or all day in a Trade Show Booth gathering crowds and informing Trade Show attendees of your companies offerings also make an excellent use of a Close-up Magician. IS IT DIFFICULT TO ORGANIZE? A Strolling, Close-up Magician is the easiest entertainment to organize because they require absolutely nothing. 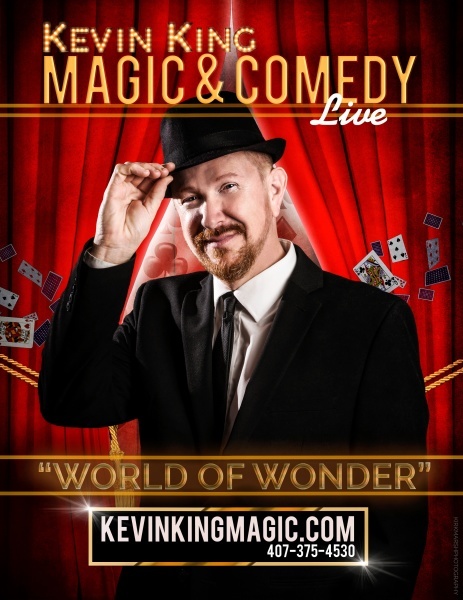 All Orlando Magician Kevin King needs is an audience and he is good to go. Kevin will make your event planning easier. WHAT STAGE SHOWS DO YOU OFFER? Kevin King's Stage Magic and Comedy Show is 30 minutes to One & 1/2 Hours and is perfect for larger events such as awards nights, annual dinners, corporate & personal events. It is a show that plays very big and is suitable for large audiences. The show is a dynamic and action packed production featuring breath taking Magic and Kevin's own brand of clean humor. Playing cards appear out of thin air, wine bottles magically multiply, people's minds will be read, a signed borrowed bill will be destroyed only to magically reappear in a sealed envelope in a zippered compartment in Kevin King's wallet, and so much more! IS KEVIN KING'S MAGIC & COMEDY SHOW DIFFICULT FOR US TO PRODUCE? No, it is actually very easy and can be performed in as little as a 10ft. x 10ft. space. HOW MUCH WILL KEVIN KING'S PERFORMANCE FEE BE? The reason I don't have prices on my website is because every inquiry is different and has different requirements. Give me call I'm friendly and approachable and we can discuss your booking in detail or fill out my submission form that you will find on this website. We can see what will work best for your event and I want to make sure that we give your guests an experience they will love and talk about for a very long time to come.